Tara Star Nails: Dupe Alert!! MAC Mean & Green = Hard Candy Beetle. Seriously, they are identical. I've never seen this close of a match between two different brands before. Can you tell the difference?? I sure can't! Mean & Green was released with the MAC Venomous Villains Collection in Oct. 2010 and retailed for $13.00. (MAC polishes now cost $14). It was a limited edition polish and sold out FAST. I just checked e-bay, and found it for $40! I just purchased Beetle at Walmart for $4.00. Go figure! 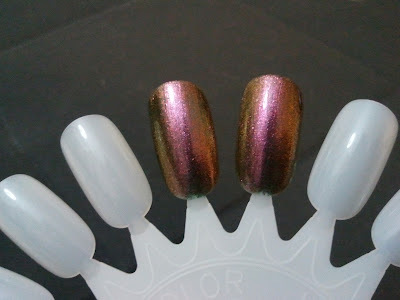 And Beetle is a good dupe for Orly's Space Cadet.